Alexander Gray Associates presented Processing Abstraction, 1960–2013, an exhibition of work focused on process- and material-based abstraction, pairing historic and recent work by Gallery artists Heidi Bucher, Melvin Edwards, Harmony Hammond, Hassan Sharif, and Jack Whitten. Underscoring conceptual parallels between the artists’ process-oriented paintings, drawings, and sculpture, the presentation examines the role and impact of abstraction as a vehicle for artistic, social, and political commentary. The exhibition spotlights emblematic examples of the artistic innovation that placed these artists at the forefront among their peers. 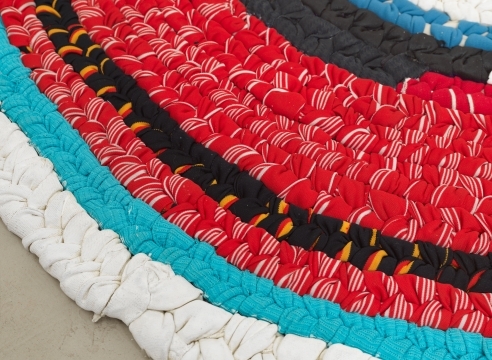 Making their debut at Art Basel Miami Beach 2013 will be Heidi Bucher and Harmony Hammond. Bucher’s groundbreaking technical experimentation is represented through her castings of domestic spaces and objects in resin and latex that resulted in emotionally charged and formally resonant installations and sculptures. Hammond’s presentation includes both 1970s and recent heavily textured paintings that combine gender politics with post-minimal concerns of materials and process. 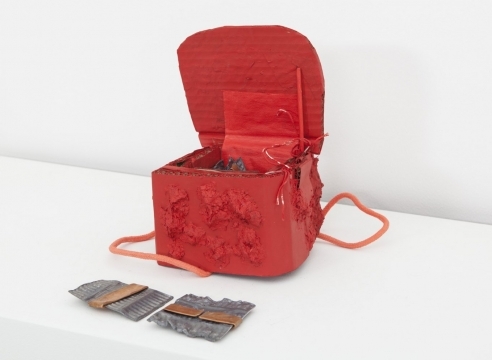 Also on view is a selection of Melvin Edwards’ iconic Lynch Fragments, which exemplifies the extraordinary range of expression Edwards achieves with his method of welding industrial found-objects into new forms that explore the relationship between material and formal abstraction. The selection of works by Emirati artist Hassan Sharif speaks to the limits of discipline or singular approach. His systematic abstract drawings and sculptures employ mark-making and weaving techniques to address arbitrariness and social dogma. Historical and recent examples of Jack Whitten’s painting embody his pioneering role and experimental attitude by testing the roles of gesture, surface, and content within the realm of abstract painting. Whitten employs abstraction as a tool for overcoming conventional boundaries of paint as medium. Rare examples from his 1970s period will debut at the Fair. The Gallery’s Kabinett presentation features a focused selection of historical works by Luis Camnitzer executed between 1972–73. These works represent a key moment in Camnitzer’s New York-based career, one in which he shifts from printmaking to alternate artistic mediums. Pintura con títulos (1973), one of the few painterly works executed by the artist, explores Camnitzer’s use of parody and syntax to expand on the impulses and mythologies of Abstract Expressionism and Conceptualism. A complementary selection of early works on paper emphasizes accumulative process and material transformation, blurring the lines between method and medium. Together, these slices of Camnitzer’s early practice anticipate current modes of formal and linguistic abstraction. The Gallery presents the video Mil e um dias (1001 Days) (2007) by prominent Brazilian conceptual artist Regina Silveira. The video is a combination of live action and animation with a soundtrack that alternates rotating images of night and day. The images slowly expand and contract, in a movement resembling that of a camera shutter, as the landscapes mix and regenerate, recalling the tradition of Brazilian concrete poetry. The continuous succession of interloping days and nights alludes to the infinity of time, evolving horizons, and interchangeable hemispheres. Kabinett sector participants are chosen from the Galleries sector to present curated exhibitions in a separately delineated space within their booths. The curatorial concepts for Kabinett are diverse, including thematic group exhibitions, art-historical showcases, and solo shows for rising stars. Organized in association with David Gryn, Director of London's Artprojx, Film sector presents works across two venues: inside the Miami Beach Convention Center, and in the outdoor setting of SoundScape Park where works are shown on the 7,000-square-foot outdoor projection wall of the Frank Gehry-designed New World Center. Selections include works by some of today’s most exciting artists from Latin America, the United States, Europe, Asia, and beyond.